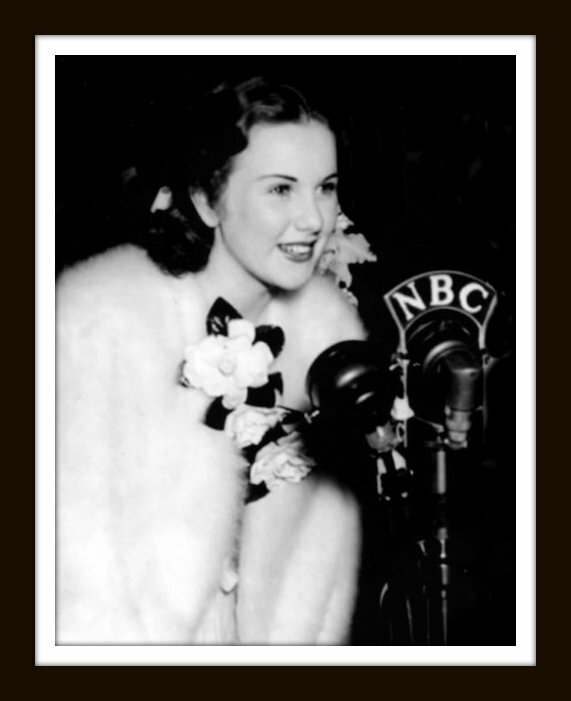 Deanna Durbin is now the most popular new microphone star of 1937. She has also been made a honorary member of the American Legion. "The modern Jenny Lind" - so she has been called by Lawrence Tibbett - was born in Canada in 1921. Her parents had emigrated from England to that country. Later, they came to Los Angeles. With them were two daughters, Edith and Edna (Deanna). Slightly over five feet tall with blue eyes and brown hair, Deanna Durbin is considered the most promising singer ever to appear in Hollywood. Yet there was no particular musical talent in her family. She owes her discovery and development as a singer to her sister, Edith, and her chance in life to the faith and persistence of a cinema agent, Jack Sherrill. She sang when a small child, but her voice did not attract attention until she was ten years old. Left at home with her sister, she began to sing, Drink To Me Only With Thine Eyes. When the song had ended, Edith suggested that she sing it again. An hour followed in which Deanna sang and Edith played. Deanna was long in bed when her parents returned. "Father," Edith said, "I think Edna has a great future as an opera singer." She saw his expression. Such a career was far away. Money was scarce. Lessons were expensive. "I'll do it," said Edith, who was soon to teach her first term of school. When Deanna was twelve, she accompanied Edith to a recital. Little did she realize that her performance would mean the beginning of a brilliant career. MGM had decided to film the life of Madame Schumann-Heink. A girl was required to play the role of the great singer when she was young. It had been suggested by the studio that Jack Sherrill locate such a girl. A note came to him from a woman in the neighborhood who had read of his quest. There was a preview of an important picture that night. For several hours, while destiny waited, he debated which to attend. Finally, he went to the recital. To please her sister, Deanna decided to sing Drink To Me Only With Thine Eyes. Sherrill was astonished. The next day he called at the Durbin home and took Deanna to the studio for a test. The studio gave her an optional contract, to be renewed or dropped every three months for a year. The salary mentioned was larger than the combined earnings of the family. The future beckoned and their hearts were light. But their happiness was not destined to continue long. Sadly, Madame Schumann-Heink fell ill and the film was shelved which left no work for Deanna. Deanna's sister taught school with heavy heart that day. Returning home she found Jack Sherrill consoling her sister. Willing to spend money and time on Deanna, he said, "Why this is just a beginning. We're going to put your name in electric lights yet!" Leaving the house, Sherrill took Deanna to Andres de Segurola who was twelve years a baritone with the Metropolitan Opera Company and a teacher of voice in Hollywood. "You have a future," de Segurola said to Deanna after he heard her sing. Still poor, the Durbin family had the wealth of dreams again. After months of coaching by de Segurola, she went with Sherrill to Universal Studios where a film called THREE SMART GIRLS was in preparation. This was a trying time for the company. It had just been reorganized and a successful picture, both artistically and financially successful, was needed badly. Charles Rogers, the chief executive, was busy with many matters, but at last consented to hear the young girl in the cheap cotton dress. Not knowing that she was worth more to his company than all of Wall Street, he gave her a contract. The role called for more acting than singing. Deanna didn't do too well in the acting test. It seemed for a moment as though she would be replaced. A new and influential friend came to the rescue - Henry Koster, director of the film. He went to Mr. Rogers. "I will teach her to act," he said. "She will save the picture if we save her." Henry Koster gave her his entire attention and replaced, as far as possible, acting with singing. During the filming of the picture, which was to cost $100,000, the budget had to be increased on three occasions. Finally completed at $400,000, it became the box office success of the year, earning $1,600,000 and creating for the company a valuable new star - Deanna Durbin. By law, Deanna still attends school three hours a day even though she will earn $150,000 this year. The dream did come true and Deanna Durbin's name blazes in electric lights all over the country. Deanna Durbin has won her fame right smack in the middle of that awkward age - the early teens - which crippled the careers of every screen prodigy on record before her, from Baby Marie Osborne, Baby Peggy, and Virginia Lee Corbin through Jackie Coogan and Mitzi Green. Which hangs today like a threatening thundercloud over the brilliant tops of Shirley Temple, Jane Withers, Freddie Bartholemew and every youngster in the business. The studios frantically make movies before the storm descends, but Deanna is singing in the rain! She is the only one ever to do this. She is the only young star in Hollywood who has ever been able to face with a merry, fearless laugh the gangling clumsiness, the shy self-consciousness of adolescence. Indeed, a town jealous of sophistication and savoir-faire eagerly acknowledges her as the most perfectly poised, fresh and charming person it possesses. All that is the miracle of Deanna Durbin. And it is no accident. I found that out after I had been with Deanna two minutes. I discovered it when I told her why I had come. I wanted, I said, to learn her secret. If she had one, I said, there were millions of young people all over the world who would be eager to learn it. Early adolescence was no joke. It was sometimes tragic - too often torturous. Frankly, I had small hopes of a sound answer. Self analysis at sixteen is rare. Deanna looked me straight in the eye. Her eyes are variable - sometimes they are a bright blue, sometimes grey, sometimes hazel. But they are always clear, frank and intelligent. "I think I know what you mean," she said at once. "I think the answer is, be your own age. If you try to hold on to your little girl years when you’re really growing out of them, you look foolish. If you try to be grown up before you really are, you’re just as silly. But if you can manage to look and act like just what you are, there’s nothing at all to worry about. It’s mostly a matter of common sense. And it’s funny you mentioning that subject. All morning I’ve been doing that very thing on the set. In THAT CERTAIN AGE I’m supposed to be infatuated with Melvyn Douglas. So to impress him, I dress up in my mother’s evening gown, paint my face, do up my hair and parade across the room." Deanna laughed. (She doesn’t giggle, she laughs). "He laughs, of course," she said. "So will everybody else, I think when they put it in the picture. You see, when you’re pretending to be something you’re not, you’re really just giving a comic performance." Deanna avoids the comic performances that ordinarily go with that awkward age - on either the young or the old side. She does it by the way she acts, the way she thinks, the way she has her fun, the way she picks her friends, trains her mind, develops her talents and the way she builds her body. She does it by the clothes she wears, even the modest make-up she uses. And it is all hinged, as Deanna says, on common sense, a commodity as free as the air. Any young girl with reasonable attractiveness and intelligence can be just as poised and personable, Deanna is sure of that. Being in the movies and working with older and talented people makes Deanna especially fortunate. Her friends are directors, Norman Taurog, Henry Koster, and Edward Ludwig. Most young people, I pointed out, are shy and embarrassed around older people. They are self-conscious. "That’s where my singing has helped me," said Deanna. "It has given you poise?" I asked. Her answer was not what I expected. "It has given me something to talk about," Deanna said. "Shyness comes from nothing to say. When you’re with older people and you can’t talk to them about anything interesting, naturally you’re embarrassed. But if you study anything worth while whether it’s music, painting or books - anything, you’ll always have something to say that will interest people." Deanna has studied singing since she was ten. She still studies it every day with her teacher, Andres de Segurola. But singing isn’t all. She reads everything she can lay her hands on. This past year, in spite of the terrific amount of time her pictures have taken, she read Gone With The Wind, White Banners, Northwest Passage and a dozen other contemporary books. She also reads with great enjoyment Shakespeare’s plays and sonnets. That seemed a little adult for a 16-year-old girl, so I asked her if she really liked it. "Yes," Deanna said honestly, "I do. Joe Pasternak gave me a set. It contained a lot about Shakespeare’s life and times. I read that part first. Then, after I knew who he was, I wanted to read everything he wrote. There are two ways to learn anything. An interesting way - and a boring way. I like the interesting way." She told me about her recent trip to Washington. Like every other schoolgirl who visits the nation’s capital, Deanna took in the standard sights - the White House, the Capitol Building, Supreme Court, Lincoln’s Memorial and so forth. But she didn’t just breeze through. She investigated the interesting sidelights of every place. She told me how the Bureau of Investigation worked. She described, in colourful words, how she stood beside the sorting machine and watched the hunt for a murderer. "Just think," breathed Deanna, "I was right there when they caught him!" If Deanna sounds a little old, a little serious and intent for her age, it is because she grew up around older people. Her sister, Edith (Mrs. Heckman), is considerably older than Deanna, and has always been her closest friend. Much of Deanna’s little girlhood was spent in her sister’s house. But with her unusually keen perception of the dangers of her trying age, Deanna consciously avoids being too much in the company of grownups. She is anxous to avoid being a "little old lady." Recently she entertained with a party, inviting a crowd of kids her age to her home. They were her old public schoolmates and a number of youngsters - all her age - who have worked in her pictures including Helen Parrish, Jackie Moran, and Adele Craig. They danced, and, as a concession to grownupness, Deanna had them all come in formal clothes. But when they got down to real fun they acted their age. It is amazing to look at portraits of Deanna Durbin taken only a year or so ago and then face her today, as I did. The contrast suggests one of those "Before and After" advertisements. The old pictures we looked at even made Deanna smile. Deanna has also skipped the health upsets so often reflected in the muddy and discoloured skins of adolescents. The reason, however, is pretty hard to understand because Deanna eats anything she likes and that often includes steak, spaghetti, cake, gum drops, chocolate ice-cream and a whole lot of other things, not particularly designed to clear a youthful complexion. "I’m about the best customer the hokeypokey man has," confessed Deanna with a swell grin. The "hokeypokey" is the sweets vendor who trundles around the Universal lot jingling an enticing bell. It never fails to lure Deanna from her set. "I suppose," she observed, "I’m just too busy to let anything make me sick!" But Deanna takes care of herself with the unpretentious levelheadedness that is the keynote of her whole young character. Often when she’s making a picture, she goes upstairs to bed right after her supper, reads a brief while and goes to sleep. When any illness does attack her, a cold or such, it settles in her throat. Then Deanna sensibly enough puts herself in rigid Coventry. She won’t talk to anyone and she doesn’t want anyone to talk to her. I found recurring as I talked to Deanna, a significant phrase. To so many questions Deanna answered simply, "I haven’t time." She hadn’t time to learn to sew or cook properly. She never takes little vacation trips that are so dear to Californians. No time. Even boys - she hadn’t had time to think or worry much about them. She said it each time with no tinge of wistfulness or regret. She doesn’t feel that her busy days are robbing her of her normal youth. In fact, I suspect that Deanna is grateful that her work is crowding out the doubts, confusions, and torments of her age. For she said, "I’m fortunate to be busy in such an interesting way." The moral for other girls might point to finding an interesting way to keep busy. Or at least to finding something to do and doing it with all your heart. For some of the deepest pangs of the "teen" years come from a goading indecision as to what shall be done with life. Deanna escapes all of that when she says simply, "I want to be an opera singer." It is hard to know your own mind so young and Deanna’s great talent has made her decision easy. But Deanna does not use her career as an excuse to shirk the responsibilities that come with growing-up. Her maternal instinct is well developed and she still has her dolls, too. She’s conscious of boys all right, but they don’t bother her. She goes to the movies or to parties with them when she wants. She doesn’t go to nightclubs or dancehalls because she herself doesn’t care to; she doesn’t think it’s time yet. There is no family ban against it. No one tells her when to be in; no one has to. She is too mature herself to be "crazy" about men or to get wild crushes. Although, she admitted, she liked it when Melvyn Douglas during the filming of THAT CERTAIN AGE said she looked nice in her new dresses. It didn’t surprise me that one of Deanna’s favourite movie stars is Spencer Tracy. Marriage is far off and very vague in this young star’s busy mind, but her ideals of marriage and a home have been greatly influenced by her sister, Mrs. Heckman. The Heckmans are in only moderate circumstances, but their home is stable and they are completely happy. Money, in that respect, does not seem important to Deanna. Her mother told me that Deanna would be satisfied if she could have a home as happy as her sister’s. Deanna has no allowance. If she needs anything and wants it, she buys it herself. She has access to her money. Usually she has little use for it, but she can spend as much as she wants. It’s indicative of her common sense make-up though that her dog, Tippy has no pedigree, is not even a purebred and cost her exactly two dollars. Deanna feels the responsibility when she entertains. She doesn’t like to sing at private gatherings. It embarrasses her; it seems as though she is showing off - a feeling she never gets with large audiences. But she will sing, and graciously, if she thinks everyone wants her to. One afternoon when she was in Washington, Deanna received the local newspaper critics. Critics, after all, are only human. They found Deanna a major attraction; some stayed pretty late. But although Deanna had some important plans for the evening, she remained the smiling hostess until the last person had gone. Courage, responsibility, direct action, and common sense, had enabled Deanna Durbin to face without flinching her first important audience on talent night at the Trocadero. It took her before an intimidating microphone on Eddie Cantor’s radio show. It brought her face to face with her first camera lens in THREE SMART GIRLS. It allows her shoulders now to support the responsibility of the success of Universal Studios. It, too, is what today lifts Deanna Durbin over the hurdles of that awkward age with an absolute unprecedented grace and ease. It enables her to look out on a new grown-up life with fearless, eager eyes. And to welcome it in a forthright manner. Deanna remembers one of her teachers saying: "Do your best, don’t be afraid and there’s nothing to worry about." Sound advice to pass on, I thought as I shook her hand and reluctantly yielded her pretty face to the cameras. On her way out, Deanna bent and whispered something in her mother’s ear. When she was gone, Mrs. Durbin smiled. "She asked me to tip the waitress," she confided. "When her pictures are finished, Deanna always has gifts for the people who work with her, but I have to hand them out. Deanna doesn’t think it looks right for a young girl to give gratuities to older people." The idea, somehow, was a pleasant thing and I liked Deanna as much for it as for anything I had heard. It was becoming to her years. It was just another way in which Deanna had practiced so successfully what she preaches - "Be yourself." The story of sixteen year old Deanna Durbin is more than just an entertaining article - it may teach you a lesson to brighten your whole life. What is the secret of her charm? Why has she climbed up to stardom in such a short time? She is termed the Cinderella of the picture world. From the obscurity of a simple home life she has mounted close to the top in the motion picture world. What is there about her that has made her such an outstanding star? Those are the questions that are being asked everywhere at this time. And to analyze her extraordinary successes and to try to fathom its associated mysteries would be difficult or perhaps impossible. Naturally, most people would say it certainly is her wonderful voice. Doctors who have examined her throat have maintained that she has the vocal chords of a fully developed woman, although she is still in her early teens. But there is something in her voice that transcends mere vocalizing. There is keen enthusiasm with a range of feeling that is far beyond her age. She radiates vivid personality in song, and there is also the charm of extreme youth associated with simple naturalness that is indeed alluring. In one of her recent photos she has been used by the directors to announce her forthcoming appearance in a new picture. The glamour of her personality is thus receiving very definite recognition by movie executives. Success has apparently not spoiled her in any way. She is her same wholesome self, so her girlish chums maintain. At sixteen years of age, she is five feet four inches in height and weighs one hundred fifteen pounds in ordinary street apparel. The human voice is our most marvelous possession. It can cause one to run the gamut of our emotional "scales." It can bring tears or laughter, and I never realized this more keenly than when I first heard Deanna Durbin sing in THREE SMART GIRLS. And I heartily endorsed the comments of some of the professional critics. She certainly had charm, poise, and personality, and stage presence was apparently a natural possession. I imagine Adelina Patti, Jenny Lind, Rosa Ponselle must have had similar voices at her age. So when visiting Hollywood, deciding to interview some of the stars, Deanna Durbin was naturally included. She is indeed adorable, modest, and somewhat shy in spite of her screen experiences. There is no particular evidence in her personal appearance to indicate her remarkable possession outside of the tones in her speaking voice which is charmingly melodious. And when she turns her face toward you, there is within the depths of her blue eyes, personality plus. And I remarked to the director after a brief conversation that she would soon be breaking hearts, and was surprised when he announced that she was already quite an adept at that game, as was evidenced by the quantity of mail she was already receiving from young men. 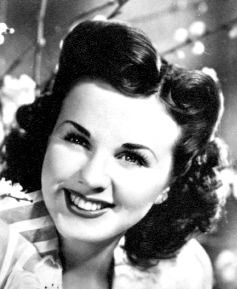 Deanna Durbin was reared in the environment of an ordinary home. There was nothing especially unusual to indicate her extraordinary talent, although she acquired the habit of singing at a very early age. She could carry a tune when she was three years old and she loved to sing. The only characteristic that was a bit unusual was her possession of a remarkable degree of determination, and her success also indicates that she must be well supplied with enthusiasm and ambition. At three years of age, she is said to have given evidence of having a will of her own. She acquired the gum chewing habit very early and she did not like to pose for pictures. Fond parents are always proud of their offspring and naturally like to have photographic records at different ages. And they finally overcame Deanna's dislike of posing for pictures by bribing her with gum, and she acknowledges that she is still an addict to this American habit. Her father (James Durbin) is an Englishman who came to Canada, seeking additional opportunities offered in this new country. He was not greatly gifted with physical stamina and his parents induced him to learn ironmongering, and that was his trade when he came to Canada. But the cold winters in that northern climate were not pleasing and he was finally lured to California. It was this change in the family's residence that brought the opportunities that finally made such an amazing change in Deanna's life. Deanna was able to spend her summers at Yellowstone Park and on Catalina Island, which undoubtedly had much to do with building the vital stamina which is so important in developing the voice. Deanna admits that singing was always a source of joy and delight to her, and, in fact, there is ample evidence of that in the songs she sings for the screen. It is well known that if one arouses the emotions of an audience, the actor or singer must first of all be similarly affected and there is a definite sense of joy in the expression and tones of Deanna's voice in the songs she sang with so much feeling in the various characters assumed onscreen. From a very early age her voice was heard from morning till night at home when she was not otherwise occupied. Fortunately, voice placing did not bother her. Teachers were apparently not required to develop her voice. She always sang with ease and naturalness and her vocal powers automatically improved with age. Deanna's older sister, Edith was educated to be a teacher. Singing lessons were beyond the family budget, so Edith, through her earnings as a teacher, arranged for Deanna to take weekly lessons which naturally were greatly enjoyed and were an added stimulus to her singing exercises. Deanna is a very active girl, although she does not admit to being a tomboy. She loves walking and much of that exercise is compulsory around the studios. She is fond of swimming and undoubtedly that exercise has much to do with building the bodily vigor with which she is so well endowed. She is also fond of bicycle riding which she enjoys frequently. Roller skating is one of her favourite exercises. A short time after the appearance of THREE SMART GIRLS, she went to a public roller skating rink, hoping to enjoy herself as usual, but in no time she was recognized and there was no roller skating after that. Her time was spent autographing cards, bits of paper, or whatever could be obtained at the moment to secure the signature of this famous little star. Deanna's talent at school was not sufficiently outstanding to bring the unusual attention that she deserved. When she joined the choir of the community church, her audiences were very appreciative. She sang hymns and anthems and helped greatly to fill the pews with appreciative listeners. And many who heard her on those occasions acquired the impression that some day she would be among the great vocalists. Jack Sherrill, the well known theatrical manager in Los Angeles must take the credit for discovering her, although a friend of his called his attention to her. It happened at that time that MGM was searching for a girl to take the part of Schumann-Heink in a picture they intended to produce. They were looking for a girl who could play the part of the diva as she appeared when she was a girl. Jack Sherrill, after listening to the commendation of his friend, heard Deanna sing, and he enthusiastically recommended her to MGM for the part in the picture they intended to produce. She was signed on a seven year contract at $150 per week, which must have seemed like a huge fortune to the Durbin family. But before the proposed picture could be made, Madame Schumann-Heink fell ill and the picture was cancelled. However, the officials of MGM apparently did not appreciate Deanna's special abilities, for no further pictures were planned for her. The enforced idleness following the intense activity necessary for the preparation of the Schumann-Heink picture was a little boresome to Deanna, but she still had her school studies and singing lessons. To be everywhere admired is a source of untold satisfaction even at an early age. And to be selected as a possible movie star is indeed a thrilling experience. Deanna was probably too young to appreciate fully the value of the opportunities thrust upon her, but her idleness following the MGM experience was not greatly prolonged. Jack Sherrill was convinced that he had a possible star in Deanna. As the MGM studios did not apparently appreciate her, he took her to Universal Studios where she had an audition. She made a very favourable impression and a contract was soon signed with Universal. That was really what might be termed the beginning of her motion picture career. It was about this time that Eddie Cantor first appeared in Deanna's life. He heard her sing and she was invited to appear on one of his broadcasts as a guest. Her success was immediate and astonishing, and she has had an important part on his program ever since. It is stated that her first appearance on Cantor's program brought over four thousand letters. But the first picture that stamped Deanna as a star was THREE SMART GIRLS. When they started to make the picture not a great deal of enthusiasm was manifested by the directors, and it is said there was quite a difference of opinion as to the status of the various characters of the story. Some of the directors wanted to make Deanna the outstanding star, although other officials differed. Deanna finally won out, however, and was selected to be the star of the picture, and instead of being a second class picture as it was origially planned, it was put out as a Class A picture. And it was in THREE SMART GIRLS that she made her first smash hit. She greatly admires Adolphe Menjou as an actor, although Clark Gable is another favourite of hers. However, when it comes to selecting her favourite pictures, Mickey Mouse is the headliner. And she has not gotten entirely over her love for books that especially appeal to children - Little Women and the sweet Winnie The Pooh are among her favourites. She has a record for reading that is difficult to duplicate. She was so charmed with Gone With The Wind that she read the book through twice, which indicates that she is well supplied with dramatic appreciation. And she is not without faults that are quite usual in a girl her age. She had the habit of biting her nails and after much effort on the part of her mother she was finally able to cure this unpleasant habit by frequent manicures. In my interview with this very interesting little star, she stated that most of the time her work seems like a big game and that she enjoys it very much. She admitted that it wasn't the admiration of any great vocalist that induced her to give so much attention to singing. She just loved to sing and indulged herself at every possible opportunity. When her sister arranged to pay for her lessons they were able to afford only one per week. She is now studying the piano and expects to become quite an efficient pianist, provided she has the time to practice. She states that the range of her voice is from middle C to C sharp on top. Her voice is termed a lyric soprano. I inquired of her whether she was especially interested in developing herself physically. She admitted a great liking for swimming, although she did not have an opportunity to acquire skill in that exercise until four or five years ago. Now, however, she can swim the crawl, the trudgeon, and side stroke. She has no regular time for swimming and usually does not continue the exercise beyond fifteen minutes. She is not attracted by sunbaths, as is quite evident by the lack of suntan in her complexion. She states that she does not tire easily, although after a hard day's work, which included swimming, there is some evidence of fatigue. She has no regular exercises that she takes, other than the walking required in her work. When she is making a picture she claims there is no time for exercise, but during vacations practically all her time is given up to recreational exercises. She greatly enjoys ballroom dancing. No particular attention has been given to her diet, although her mother states that it is confined entirely to wholesome, healthful foods. She does not lunch on ice-cream sodas and pie, which is the usual fare of many city girls her age. For breakfast she usually takes a glass of orange juice and perhaps some chocolate. She has a good appetiate at noon and eats a hearty luncheon, although she is not allowed to eat between meals. She has never tried to drink a cocktail, nor tasted beer. At luchtime she frequently has a lambchop or a small steak. She admits she likes potatoes and is fond of sour French bread. Her favourite vegetable is carrots. The work that she is required to do in her pictures, she admits, is rather arduous at times. She usually has to get up at six-thirty in the morning although she does not start work until about seven-thirty or eight. She is allowed an hour for lunch. She states however that luncheon usually requires only a few minutes for she must get back and have her make-up checked so that she can be ready for work at one o'clock. In the movie world rules are rigid. You are allowed little deviation from them. Children, according to government rules, may not work more than four hours without a rest and something to eat. At dinner time, Deanna admits she indulges in a hearty meal. She likes tomato juice, vegetable soup, although she does not like fish. She admits, however, liking strawberry sundaes for dessert. She drinks coffee occasionally and sometimes she drinks tea, but milk is her favourite drink at meals. When she first rises in the morning she takes a shower bath. The shower must be warm to begin with, alhtough she finishes off with cool water. She admits a fondness for ping-pong and plays it frequently. She has a set at her own home. Deanna is indeed a remarkable girl, and yet she is not much different from many of the average wholesome American girls of her age. At seventeen, Deanna Durbin is the Queen of Hollywood. She has been credited publicly with helping to pluck Universal Studios from the menacing shadow of bankruptcy. Her fan mail, which stood at zero four years back, ran 1600 letters a week two years ago - now they just weigh it and consider it a side industry. Most regal attribute of all, she will soon have her first million dollars. Deanna earns about $5000 a week, which is royalty at its handsomest. Every Wednesday, Universal pays her $1750. At the end of each season, upon the completion of her two obligatory films, she receives a bonus of $100,000. From the sale of merchandise marketed under her name, sweaters, compacts, play suits and such, she realizes another $1000 or more a week. Deanna's million is not unique in Hollywood, her position in the screen world is. There never has been anyone quite like her. She began as a child star in a sense, but no one thought of her as a new or a second or an older Shirley Temple. She has an astonishingly mature soprano voice, but while her voice might have brought her to the public’s attention, she has captivated it by other talents including being a clever little actress. There have been America’s Sweethearts (Mary Pickford was the original), America's Darlings (Shirley Temple is one), America’s Girlfriends (from Mae West to Hedy Lamarr). But until Miss Durbin came along, there never had been the perfect America’s Kid Sister. Deanna somehow managed to fill the bill. On the screen she is eager, vital, coltish, amusing, unspoiled, and disarmingly natural. Put them all together they spell the one word almost every critic has used to describe her: "Refreshing." That applies to her offscreen as well as on. She has none of the affectations of the usual Hollywood Queen. Although she is aware of her importance, she tries desperately not to seem important. She saw her first horse races this summer. On each trip to the track her betting capital was $10. Once she lost $3 the other times she picked up $3 or $4, which thrilled her as much as it would have thrilled the Deanna of her pictures. She has no personal budget, yet her allowance, while adequate, is not extravagant. She has dates, goes dancing and dining with young men, sometimes stays out as late as 10:30 at night. The gossip columnists keep close tabs on such goings on and have announced her engagement several times to as many young men. Deanna wisely made no denials; the items disproved themselves. Her directness and simplicity have contributed to Hollywoodiana. There was the time Leopold Stokowski came to the studio to meet her before beginning the movie ONE HUNDRED MEN AND A GIRL. Deanna was to sing for him. She was as excited as any budding prima donna would be, and as shy as any proper 15-year-old should be. Stokowski came and was presented. "Hello," she said, and sang, "How nice", Stokowski said, and bowed. "Thank you, sir," she said, and left. That wasn't Deanna Durbin movie queen speaking; it was Edna May Durbin, the daughter born to an obscure railroad shop worker and his wife in Winnipeg, Canada on December 4, 1921. Edna May, now Deanna by courtesy of Hollywood, remained in Winnipeg just long enough to win a prophetic pewter plaque for being the loudest crying baby at the Province Fair. The family migrated to Los Angeles because of Mr. Durbin’s ill health. There Edith, the elder daughter, became a teacher and paid for Edna May's tuition at a local voice school. In 1935, John Considine of MGM decided to film a biography of the opera diva Schumann-Heink under the title GRAM. He wanted a youngster to portray the singer as a young girl. None of the contemporary child stars seemed to qualify, and a talent search was begun. Jack Sherrill, an agent, joined the posse, and discovered Miss Durbin in her obscure singing class. MGM signed her for $125 a week, but here the tale grows stranger, for Schumann-Heink became ill and GRAM was forgotten. Deanna was let go. Sherrill took her to Walt Disney Studios to suggest her employment as the voice of Snow White. Mr. Disney ruled her out on the grounds that her singing was "too mature." At Universal Studios, Rufus Le Maire, possibly because he, too, had just left MGM, thought she had possibilities. Deanna was hired at $150 a week, and promptly tossed into the arms of two foreigners, Joe Pasternak and Henry Koster, whom the studio planned to discard by the simple expedient of allowing them to make a picture which the studio was sure would be so bad as to justify it in firing them. Koster went to work. In two weeks, he had taught Deanna to walk and move gracefully. The tests were made and Koster told the executives he had a star. The picture was begun with a production budget $100,000 and Miss Durbin’s name ninth on the cast list. When the budget was increased to $115,000, her name was in eighth place. Another $10,000 was added and she moved up to seventh. This continued until $400,000 was spent and Deanna Durbin’s name led all the rest. The picture was THREE SMART GIRLS and the rest is history. Universal is looking ahead to nine more Durbin pictures costing $8,000,000 exclusive of her salary, and designed to advance her from the status of screen adolescent to that of a romantic leading woman. Deanna Durbin is astounded by the turn of events of the last four years; she is a trifle aghast when fans swarm round her clamouring for autographs; and she frankly admits to being amazed at the size of her salary. But, except for a brief flurry early in her career, she apparently has her feet planted firmly on the ground and retains a perspective and a sense of values that are as surprising as her four years of glory. "I can't get used to being the center of attention!" she says. "They don't treat me as a movie star at the studio and I like that attitude. I often go shopping on Hollywood Boulevard and no one knows me, and I enjoy that normal privacy. But when I go to the racetrack or to resturants where people expect to find actors and actresses they do recognize me and point me out and honestly, I enjoy that, too." There was a deal of talk a few years ago about her operatic ambitions and she was quoted frequently as wishing she were old enough for LA BOHEME and MADAMA BUTTERFLY. Now, with the delightful gravity of a child playing at being grown up, she admits she hasn’t decided her future. "I have no plans for opera or concert work," she says, "I'm not ready for either of them yet," and then she added, with superb unconcern for its effect on the directors of the Metropolitan, "Opera seems to be fading in importance and it is possible that, when I am ready for it, it will have ceased to exist as a career. I like pictures and it may be that my entire future is with them." Then Deanna said something that may go down in history as the year’s most naive remark. It was, "I have no plans. I'm just drifting!" Under the newly enacted Coogan Law, her drifting will be under legal convoy, with a well charted financial course. Under that law, designed to prevent the exploitation of children and their earnings, the courts assume a commercial guardianship of millionaire minors. In Miss Durbin’s case, it has ruled that $15,000 annually could be used for living expenses and education, that 5 percent of her gross earnings should go to her agent (10 percent is the usual amount) and that $4200 a year should be paid to her attorney. With these specified expenses totaling less than $30,000 and her yearly taxes (about 35 percent of her revenue) accounting for $55,000 more, the court has ruled that at least $50,000 more is to be placed in trust for her. And, the Durbin's being thrifty people, most of the balance is going into government bonds and annuities, too. So Deanna, who is just drifting, seems destined to be a millionaire at 21. Hollywood delights in the success of Deanna, which proves that Cinderella stories do come true, and the industry appreciates the wholesomeness she has brought to the screen. But, successes like hers have their dismal aspects, for whenever a youngster has such an amazing career thousands of mothers besiege the studios offering their sons and daughters, who they say are more beautiful and accomplished in every way than the reigning favourite. Thousands of "duplicates" of Shirley Temple have been dragged into casting offices by their mothers, just as there have been thousands of Bobbie Breens, Freddie Bartholemews, Mickey Rooneys, and Deanna Durbins. What these stage struck parents don’t seem to realize is that imitators are not wanted and could not succeed even if a studio gave them a trial. What chance has any youngster of crashing Hollywood? Not even the proverbial one in a million. His chances are 5000 to 1 of breaking through even the first barrier of finding an agent. Without one of these representatives, Hollywood presents an unbroken line of barred doors. And agents are harder to convince than producers, for they must be convinced the candidate has great talent before they will undertake such a selling campaign. Finding the agent is only part of the battle, for producers consider it safer to say "no" than "yes." Mistakes of omission are unknown or forgotten. Deanna was dropped by MGM. Bette Davis was fired by Universal. Paramount released Ann Sheridan. Fox let Spencer Tracy go, but those errors in judgment pass in Hollywood’s swift parade. The mistakes that count because they are remembered are those involving huge sums spent on personalities that failed to hold the public’s interests. Those are the fears of commission, the ones most feared by producers. Most child stars are born of need. Had not MGM been frantic in its search for a youngster to play the child Schumann-Heink, Deanna might still be an unknown high school girl taking music lessons in a Los Angeles conservatory. The breaks came and she took advantage of them. There are probably thousands of other Deanna Durbins in the country, but the world will never know, for the curious laws of chance will not permit them to be in the right place at the right time. Deanna was a million-to-one shot that paid off. At only eighteen, Deanna Durbin is a world famous movie star and yet that fame has not changed the fact that she is a very down to earth lady who has the same likes and dislikes like any other normal teenager. She drives a grey-coloured, low-slung LaSalle Coupe to get to work and for shopping. Deanna always addresses people by their given names. She refuses to call anyone "Dear" or "Honey" or "Darling." She isn’t plump as some fans believe. Her bust is 33 1/2 inches and her waist is 25 inches, both average. Deanna's present contract expires in 1943. By that time she will have earned a salary of $1,600.000 - an amount so stupendous that it would take the United States Mint ten days and nights to turn it out in separate dollars. She saw NAUGHTY MARIETTA seven different times! Deanna is wild about new shoes - especially anything cute or tricky. She prefers sandals, pays from $12 to $22 a pair, and wears size 6. After all, Greta Garbo requires 7AA and Deanna’s friend Helen Parrish, wears a 7 1/2A. Before a scene when the wooden plank with the scene number on it is held up in front of the camera, Deanna will always lean forward and knock on the wood, but she has no superstitions. "I haven’t been in show business long enough to acquire any," she admits. Her mother still calls her Edna May which was her monicker before publicity people tagged her with Deanna. Her married sister calls her "Eggnog" and studio folks call her "Dee." Deanna’s favourite dish is spaghetti. Her second favourite dish is another helping of spaghetti. However, she can’t stand mushrooms; the sight of cauliflower makes her ill; and chewing vegetables, she says, nauseates her. Deanna has never kept Vaughn Paul waiting on a date. Nine out of ten times she is absolutely punctual. Neither dressing nor excessive primping ever delay her. "When he’s downstairs, I whip through my make-up like mad," she explains. She wears a beautiful wristwatch which Vaughn Paul, whose father is general manager of Edward Small Productions, gave her. Charles Previn, pudgy studio musical director, used to puff cigarettes while Deanna Durbin sang for him. He knew the smoke wasn’t good for her, but he wanted to teach her to warble under any conditions, and to grow up without prima donna fussiness. At home she keeps a diary, a drawer full of licorice sticks, a wig stand upon which to practice coiffures, and three midget turtles named Penny, Joan, and Kay. When she is worried about her personal problems or aggravated or angry, which is extremely rare, her speaking voice, as caught by the microphone, becomes a mumble. Once a week she reads her most interesting fan mail. She answers the best letters but does not correspond with fans regularly. She now replies to notes from French soldiers in the trenches, and has authorized the studio to send 500 of her recordings to the American Red Cross in Europe. Mrs. Kellephene Morrison admits that Deanna doesn’t take to mathematics at all. However, she can’t get enough of French and history! Mrs. Morrison says that her beautiful eighteen year-old pupil is a better than average student, although she hasn’t much time for studying. After completing her high school courses this summer, she’ll take up operatic Italian and German and take a strum at the harp. But the payoff is this: The California state law demands that Deanna continue studying of all things music appreciation! A snap for her! She never has trouble falling asleep. She wears a plain nightgown to bed, sleeps very soundly for about eight hours and dreams about twice a month. A White Russian named Alexis Holmonsky, who resides in Shanghai, China, writes her a ten page fan letter every month. He thinks it is her mission to bring peace and light to a world filled with darkness and feels she should be kept pure and not be embraced or kissed on the screen. Deanna's face is a headache to the makeup man. It’s too healthy, her complexion is too smooth, her pores too fine, and her skin too taut which causes grease paint to slide off her forehead and cheeks. Her severest critic is her brother-in-law, but her favourite critic is her sister, Edith. Recently Deanna sang at a house party and a week later sang it twice as well on the radio. Her brother-in-law bawled her out for that. He insisted she should have been as good at the party as on the air. She doesn’t see Vaughn Paul at the studio. Before they were in love, he worked on her first five pictures as second assistant director. After they fell in love he was promoted to first assistant - and then out of her pictures! Her cameraman claims that she photographs 75% better than the average star. One of the main reasons is because she has good ears! Honestly! Her ears lay back, small, flat, and perfectly shaped enabling her to be shot sideways and from over the shoulder without her ears looking like the arms of a loving cup. The only make-up corrections necessary to her countenance are shadows to make her round face appear thinner, and more shadows to make her chin sharper. Also, her lips are cut down by paint, because they are too full and sensuous for the youthful roles she plays. She sighs when watching Spencer Tracy on the screen and she is at the opening of all Margaret Sullavan pictures. Her stage preferences go to Helen Hayes and Gertrude Lawrence, though she wishes she had seen Katherine Cornell. Deanna doesn’t take a weekly allowance. "I’m not methodical enough," she says. She goes around without a penny in her purse and puts all meals and purchases on credit. "But someday, on the way to the studio, I’ll run out of gas and then I’ll be sorry." Blue is her pet clothes colour, because her eyes are blue. Six different shades of blue will change the colour of her eyes six times. Singing does to Deanna what physical exercise does to the layman. It makes her hungry. She developed an enormous appetite while recording three numbers for her next picture, the nineteenth century costume piece, SPRING PARADE. Deanna still takes three hour singing lessons from her first teacher, Andres de Seguroloa. She goes to his home every day for the lessons. The two men in the world she would like most to meet are Toscanini, the great Italian conductor who can study a score once and know every note from memory, and Franklin Roosevelt of Washington D.C.
She claims she has never met a boy she couldn’t get along with. There are no male traits that annoy her and she never fights with fellows. She doesn’t care for an early breakfast. If she could she would like to skip it altogether and get up in time for a big lunch which she does during vacations. If she weren’t a singer, Deanna might be a music teacher. And if she couldn’t be that, "Why, I’d be nothing. I’d just be flopping around." She owns miniature prints of all her last eight movies. She also owns a small 8 mm camera and takes amateur motion pictures of other players at work in the lot. When a picture is in shooting, she expects Joe Valentine, her cameraman, to bring her a package of gum after every lunch hour. If he doesn’t she’s unhappy. And whenever she’s unhappy, Joe Valentine will shout, "Give us the big eyes! The Durbin smile!" Then she will grin. At home she sings all day long, and anything that comes to her mind, even swing numbers. She never sings anything too high when fooling around. On a date, Deanna likes to do something different. She likes the boyfriend to take her to the movies! She has her screen and private clothes made at the studio. She favours plain tailored clothes and sports dresses. The average dress she wears before the camera costs $25 and after the picture is over Deanna buys it from the studio for $12.50. She still remembers the best piece of advice ever given her. It was at the beginning of her second picture, when Adolph Menjou remarked, "Deanna, always remember, it takes as much effort to make a bad picture as it does to make a good one, so why not just make good ones?" Upon losing her temper, she never swears. She merely exclaims, "Aw, bugs!" Or, when she really gets sore, she shouts, "Phooey!" Her church is Baptist. She can do the Lambeth Walk. She laughs constantly, but never giggles. She hasn’t ever been late for a dress fitting. Her favourite author is Somerset Maugham. Over a hundred pedigreed dogs have been offered her. She has refused them all, remaining loyal to her black-haired mongrel, Tippy. She purchased Tippy some years ago in a pet shop for $2, choosing him because he liked the salted peanuts she was eating. No rituals have attached themselves to Deanna’s singing. Where the average opera star avoids starches and gulps hot wine before tackling the high notes, Deanna will calmly consume a five course lunch and then toss off one of her favourite operatic selections, One Fine Day from Puccini's MADAME BUTTERFLY. Not that long ago there was a gifted young lady who came to Hollywood and made good in her first picture, THREE SMART GIRLS. Of course, Eddie Cantor’s radio build-up of her helped, and in quick order the nation had a new celluloid star - Deanna Durbin. Five years passed, and Deanna started growing up as adolescent girls will. Producer Joe Pasternak and director Henry Koster, of Universal Studios were beset with trials and tribulations in their attempt to keep the Durbin formula intact, yet make screen plays of the lovely young princess keep pace with added years and increasing height. But they did it well, probably reached their peak (up to now) with ONE HUNDRED MEN AND A GIRL. Then their troubles began. SPRING PARADE was very good. But NICE GIRL wasn't as popular. And that was about the time that Princess Deanna fell in love with her Prince Charming, Vaughn Paul. The studio officials and Deanna's parents didn’t know what to do about it. Deanna did. She married Vaughn in one of the loveliest, nicest and most sincere ceremonies Hollywood has had the good fortune to boast about. Right after their honeymoon, Deanna started her tenth and many people think her best picture, IT STARTED WITH EVE. In it she co-stars with Charles Laughton and falls in love (for the third time on the screen) with handsome young Bob Cummings. The thing is that right at the beginning of IT STARTED WITH EVE, Universal executives responsible for the proper presentation of Deanna Durbin (Mrs. Paul) realized that all of a sudden their little princess had grown-up. She was in full bloom of womanhood, and she acted and sang like it! Their troubles were over. Charles Previn, long musical director of her films, observed that she sang with more fullness, gave deeper feeling and expression to her lyrics. Producer Pasternak and director Koster marked that Princess Deanna was more sociable, at greater ease, less bashful, considerably more interested in the cast and in what went on around her. Although their princess had always been a good actress, now her performances carried the poise of a great actress! And that is what marriage did for Deanna Durbin. The physiological process that was hindering Miss Durbin in her transition from girlhood to womanhood ran its course and Deanna became the complete actress, the knowing, well rounded songstress, a smart and comely young wife with a brand new, one hundred percent personality plus. Shy, retiring Deanna, cheated of much of her girlhood fun by her rapid rise to fame and her fears of the added responsibilities stardom brought, became braver. She and her husband, Vaughn Paul began to enjoy life. They made new friendships. Among their best friends are Bob Cummings and his lovely wife. It was as if Deanna had just begun to really live - and it shows up just that way in IT STARTED WITH EVE. Stories and rumours continue to fly thick and fast about the battle between Deanna Durbin and Universal. Gossip would have you believe: Deanna's husband is causing the problem. The inlaws are mixing in and making it a bitter family squabble. The studio is "unfair." Deanna is "out of line" and needs a good spanking to bring her to her senses. It is a token fight and will be over any time now. It is a fight to the finish and will go on for months and months. What is the truth behind the whole unpleasant mess? Why is she on suspension? Who is at fault in the row which will keep her off the screen until one side or the other gives in? The basic answer is simple: It is a business argument over certain rights. The money question is not involved. Deanna and the studio are deadlocked over how much or how little she may have to say regarding the production of her future pictures. Since, in a sense, Deanna instigated the action which led to her suspension by the studio on October 15, 1941, it might be well to present the case from her side first. A studio suspension, incidentally, is no drastic step or brand of disgrace; it merely means the player is off salary until such time as the differences are adjusted. After all, it would be silly for the studio to continue paying a regular weekly salary to a player who has refused to report for work. Deanna was a winsome youngster of 14 when she made her first smash success for Universal, THREE SMART GIRLS, back in 1936. Now she has ten highly successful pictures chalked up to her record and not a single flop. With utmost willingness she gives credit to the studio, to Producer Joseph Pasternak, to her various directors, and to the scenarists who made that remarkable record possible. She gives credit where credit is due. But she also feels that Deanna Durbin herself contributed a little something to those successes, not only through her personality, voice, and acting ability, but through the constant years of study and hard work to improve herself in every way. She wants credit given where credit is due. During those growing-up years, Deanna was content to accept, docilely and obediently, all dictums and decisions of the studio regarding her pictures. She was only a little girl, and the older and experienced heads of the studio certainly knew best. Only once was there even momentary friction, and that was instigated by her agent and parents, regarding a salary raise. The studio recognized the fairness of the complaint and an adjustment was made whereby Deanna now receives around $2000 a week in salary and a $50,000 bonus for each completed picture. Now, however, Deanna is a grown-up woman, and there’s the rub! The studio continues to think of her as a child and fails to recognize that the years of experience and study have matured her judgment and given her some wisdom about what is and is not good for her and her career. On several occasions in the past year she has found herself differing with the studio on story points, songs and other matters, but still bound by the same dictum of blind obedience. To that end she is asking that she be consulted about stories, cast, director, and producer in advance of new pictures. Contrary to general opinion, she maintains that she is not demanding final okay on those matters. She wants to sit down with her bosses and quietly discuss them, instead of hearing secondhand, or reading announcements in the newspapers, that Such and Such will be her new picture with So and So producing and directing. She wants an opportunity to express her opinion and offer her suggestions instead of being told, in effect, "this is the way it’s going to be and that’s that, like it or not!" Furthermore, she is insisting that her right to be consulted be made terms of the written contract, not a verbal promise. Promises, she has learned, have a way of being broken. In justification of her stand, Deanna points out that it will mean better work from her, for no person gives their best work when they are not happy in their working conditions, and of late she has been anything but happy in that respect. Also, she knows best what her voice can and can not do. And which songs are best suited to her voice, and what the public wants to hear her sing. That judgment she knows is corroborated by the thousands of fan letters which follow each picture. The same thing goes for stories. And in that way, later arguments which have proved costly in the past could be avoided entirely. It is not more power she is seeking, from her standpoint. In the past she has had far more than she has used. Nor is it special privileges, such as a $20,000 wardrobe for a picture, or a private bungalow such as the studio built for her on the lot. While appreciating such gestures from the studio, she has never demanded or even asked for them, it is said. She merely wants what she feels is her right: To be allowed to know what’s going on, and to voice an opinion about the things which concern and affect her. And now about the part Deanna’s husband, Vaughn Paul, is supposed to have played in the battle. The plain truth is this: Far from butting into the affair, or even advising Deanna to take her stand against the studio as a grudge gesture for his own wounded feelings, Vaughn has kept to a hands off policy. It is Deanna’s business, he says, and hers alone. And that is in keeping with the policy they established for themselves when they married last April. At that time, I remember Deanna saying that she would never work in a picture with or for Vaughn. It was an unfortunate coincidence that the differences of both Deanna and Vaughn with the studio came to a peak at the same time, and undoubtedly was the reason for the charge that Vaughn was being spiteful through his wife. Vaughn was made an associate producer at the studio in August of 1940 and was assigned to the picture, MERMAID IN DISTRESS. He had won this promotion through years of hard work after starting as a mail boy. Too, the promotion was in line with Universal’s policy of giving able young men a chance. For reasons never disclosed, the picture still had not got underway by October of 1941. Weary of the interminable delay, Vaughn resigned and set about looking for a new studio connection. In fairness to all, it should be noted that Universal never has charged Vaughn with influencing Deanna. That was the public’s idea. As for the gossip that her parents felt the studio was right in their stand, and Vaughn’s parents were urging loyalty to him, thus creating inlaw friction, Deanna maintains that it's all unadulterated nonsense! Her parents are standing by her 100 percent. She likewise knows Vaughn’s parents have never uttered one word on the subject, one way or the other. Boiled down, Deanna’s stand stacks up in this fashion: She understands and agrees that there must be authority over her, more experienced heads which may know best, but she wants the common courtesy of being consulted in her affairs, and the chance to share in the shaping of those affairs. In a paternal fashion, Universal points to their record. Through skillful and wise handling it has established and kept Deanna as one of Hollywood’s top stars, even through the tricky period of adolescence. Every picture has added to her star stature, has been good for her personally and for her career. Why, then, should it be supposed its judgment no longer is to be trusted, or that there is need or reason for consultation with her on vital points? And while "consultation" is an innocuous word, it could become tantamount to "final okay" were a basic difference of opinion to arise. Final okay could become dynamite in the hands of a 20-year-old girl, sufficiently explosive to blow the whole works skyhigh. Fortunately no bitter animosity exists. Although both sides are prepared to sit tight until doomsday, both sides would like to settle the argument and get back to work. The Durbin sets have never been closed to the press, and Deanna herself is one of the most approachable young stars in Hollywood. But this reporter just didn’t want to meet Deanna Durbin. You see, it's this way with me. Some people admire artists, some people admire writers, some people go into ecstasies over flag pole sitters - but me, I’m a perfect pushover for singers. I am certain that there must have been a frustrated soprano somewhere in my family tree for I have the greatest admiration in the world for any one who can tear into those upper bracket notes. Having spent the past ten years of my life telling devout fans how very human their celebrities are, I just couldn’t bear to meet Deanna for fear of discovering that she did not have both feet firmly on the ground. I took no chances. Just in case she turned out to be petulant and temperamental, I did my admiring at a safe distance - the neighbourhood theatre. The war has brought realism into my life, and even though I am in awe of Deanna Durbin and her larynx, I decided it was time to face Deanna, who recently got married and is now facing the age of 21. I met her on the set of THE AMAZING MRS HOLLIDAY at Universal Studios - where Diana Barrymore dashes around in a low slung foreign car, and Maria Montez makes with the sweet talk to the male press. Deanna plays a young American born orphan, who has been living with her missionary uncle in a province of Southern China. When the Japanese bring death and destruction to the province she escapes with a group of children, and after a hectic trip across the Pacific to San Francisco, she dumps them on young Tom Holliday played by Edmond O’Brien, with a delicious lie about being married to his grandfather. Deanna, I believe, is the loveliest to look at of all the stars. She simply radiates health and beauty and charm. She gives you a firm handshake, plus her undivided attention - and I must say it's a relief to meet a movie star who isn't thinking about ten other things, including the new cook and the old taxes, when she says "How do you do." Deanna was wearing a glamourous dinner gown, and looked as chic as a Powers model about to go dancing on a Saturday night at the Mocambo with Errol Flynn. In this picture, the publicity department explained to me, Designer Vera West is dressing Deanna in exciting mature gowns for the first time in Deanna's six year screen career. Despite her great warmth and graciousness, Deanna has very little small talk. Perhaps she considers that it is polite to let the guest do the talking, and most of them will, given the floor, or even a board of it. Or perhaps she discovered when she was first starting in films that the best way to keep out of trouble is to keep your mouth shut. On the set one day, during one of those early pictures, a reporter asked the fifteen-year-old girl, "Would you like to sing at the Metropolitan in New York?" And Deanna truthfully answered that some day she would like very much to sing at that famous opera house. When the interview was published the reporter quoted her as saying, quite emphatically, that she was singing soon at the New York Metropolitan. Well, you know how stuffy opera people can be. They hastily and sneerily denied that Miss Durbin - and who, pray, was Miss Durbin - would sing at the Metropolitan. Young, ambitious, and very sensitive, the little Deanna was deeply hurt. To every actress, sooner or later, comes an embarrassing misquote. Deanna got hers early. While she changed for the next scene, I talked to Bruce Manning about his lovely star. Bruce Manning, one time of New Orleans, is a very remarkable young man. He has "raised" Deanna on script paper, so to speak, since the time she was the cute little miss with the feather in her hat in ONE HUNDRED MEN AND A GIRL. Once a writer at Universal, he soon became a writer-producer and then a writer-producer-director. He is directing Deanna for the first time in THE AMAZING MRS HOLLIDAY, which he is also writing and producing. You expect to be bowled over by such versatile brilliance, but on the contrary, Mr. Manning is as friendly and comfortable as the seersucker coat he wears on hot days. Casual, fun loving, with none of the dynamics and histrionics indulged in by most directors, you wonder how he ever gets things done. Mr. Manning told me that Deanna is very definite in her opinions. In fact, there is nothing indefinite about Deanna. She also has a very keen story mind. She knows herself so well that she knows what she can do and what she can't do. Some kids were brought up on geography. Deanna was brought up on stories. Deanna settled down beside me on the couch, a bit of Nob Hill gilded swank, and with prodding on my part talked to me about her home and her husband, Vaughn Paul, now an ensign in Uncle Sam's Navy. Deanna and Vaughn, as all her fans know well, were married April 18, 1941, at the Wilshire Methodist Episcopal Church in Los Angeles, after a romance of two and a half years. They both were as excited as two kids, which they were, over building their own home in Brentwood. "It was a most satisfying experience." Deanna said with a laugh. "I enjoyed every minute of it. I mixed paints, I quarreled with the carpenters, and I planted the flower garden." The neighbourhood is full of movie folk - Anne Shirley across the street, Cesar Romero, the Tyrone Powers, the Gary Coopers, and the Fred MacMurrays down the block. The Pauls move into their new home on December 18th. But hardly had they arranged the furniture to their satisfaction, and planted the shrubs, before Vaughn enlisted in the Navy. Deanna wanted to do her part toward winning the war, too, so she went on a tour of the army camps where she sang for thousands and thousands of appreciative soldiers. Back home again she found it very lonely in her new house. So her sister, Edith and her husband, Clarence Heckman, and their small son, Richard, at age two, moved in with her to keep her company "for the duration." Deanna is simply mad about her little nephew. "When I’m not working," said Deanna, "I urge my sister and brother-in-law to take long trips so that I can look after the baby. I cook and wash dishes. I enjoy playing with him and have a wonderful time." Deanna claims she is very domestic. "I don't imagine I do any good when I'm puttering around the house," she said. "But I have a lot of fun. I like housework in my own home. I don't think I would like it in a rented house." It isn't easy to know Deanna. She is extremely courteous, but definitely not the palsy-walsy type. When I accused her of this she said with a smile, "I'm a little nuts when you get to know me better." On December 4th, next, Deanna will be 21. She will be a very independent young woman, whether she likes it or not. Ever since she started in pictures, Deanna has had everything done for her. Life was pleasant and simple and all she had to do was work hard on her singing and her dramatics. First, she had her parents to advise her and look after her, and then she had her young husband. But 1942 has found her a "war widow," like thousands of other young wives, and her own boss. She has to sink, or swim, by her own decisions now, but if I know Deanna, she’ll swim all right. Deanna admits that, like other girls, she used to dream what fun she’d have when she was 21, and free to do what she wanted. Parties, beautiful clothes, exciting trips! But now that she will soon be 21, she doesn’t think she will do any differently than she always has. She will still have that daily music lesson she has had for years. She will still work hard in her pictures, and do as many of them a year as she thinks wise. Parties - what fun would parties be without Vaughn? Or beautiful clothes? Or trips? The war has certainly messed up things good for the young brides of America. But Deanna isn’t complaining - and neither are they. Deanna Durbin has enough stage mothers to sink a ship. Just one stage mother is enough to gum up the works and make a director’s hair turn grey before his time. For those who don't know, a stage mother is the bossy mama of a child star who sits on the studio set right smack under the camera from morning until night and tells everyone how to make the picture – and just what her darling little lambkin will do, and won’t do. Deanna’s real mother has never been a stage mother. Although Deanna started working at Universal when she was only fourteen, very few people at the studio today know what Mrs. Durbin looks like. Mr. and Mrs. James Durbin visit the set occasionally where their talented offspring is performing, but they sit quietly and unobtrusively in the back, near the door, just as if they were expecting to be thrown off any minute. They are probably the least "Hollywood" of all movie star parents. But just because her mother is so sane and nice, don’t think that Deanna has been spared. Dozens of fond, fussy studio folk walked right in where mother failed to tread. Wardrobe women, hairdressers, make-up men, sound men, grips, waitresses, studio cops, all regard Deanna as "our little girl." Most of them were there when she first arrived nine years ago, and like real mothers, they refuse to accept the fact that she has grown-up. What a rumpus they made when Producer Felix Jackson decided that it was high time that Deanna, now twenty-two, and certainly no longer a child, should stop playing those sweet little girl singing roles and pitch in to something dramatic and emotionally adult for a change. Such as "Jackie" - the cheap night spot hostess in Somerset Maugham’s CHRISTMAS HOLIDAY. When those fluttering mamas saw their "child" in a form fitting black satin dress and singing torch songs, you could hear their lamentations all the way to Catalina. With practically the entire lot glaring balefully at him, Felix Jackson has decided that maybe one objectionable stage mother, but at least legitimate, would be easier to take. When the still man, who had been with Deanna on her first picture, saw CHRISTMAS HOLIDAY, he groaned, "How could they do that to that poor child?" One of the wardrobe women who has sort of mothered her for years had tears running down her cheeks. "I don’t like Deanna playing a bad girl," she said. Even her long term make-up man said threateningly, "They can’t do this to our little girl." And the sound man (Deanna has had the same sound man on all her pictures) was so upset he swore right out loud. There has always been an iron bound rule that no one, not even the director, would be allowed the privilege of swearing on a Durbin set – not even if a projector fell on his foot, or 30,000 amps conked him on the head. "My family didn’t take it quite so hard," Deanna continued with a laugh. "Mother is in Canada now and hasn’t seen the picture as yet. But I had the studio run it one afternoon for my father. When the lights came on in the projection room I think I half expected him to get up and give me a good walloping. There was a long pause, and then Dad, who is very English, softly said, ‘Well, it’s certainly different, isn’t it!’ I then breathed a sigh of relief!" The film is bound to cause much comment. You may agree with the critic who said, "It’s a good picture, but it’s not the way I want to see Durbin." Or the critic who said, "The Durbin doll will continue to pay dividends – she gives a performance to really cheer about." When Universal put Felix Jackson in charge of all the Durbin pictures two years ago, Jackson realized that Deanna just couldn’t keep on playing the same Cinderella roles. Deanna had been a successful child star and it’s a foregone conclusion that child stars don’t make adult stars. But the transition can be made, and Jackson set about making it. He had read an amazing book written by Somerset Maugham called Christmas Holiday in 1938, when it first appeared, and he thought at the time what a good gutsy picture it would make for some dramatic star, but Deanna Durbin didn’t cross his mind at the time. However, a few months ago he dragged out a script based on the book and gave it to Deanna to read. "You can’t lose your public with one picture," Jackson figured. "If they refuse to accept you in that kind of a part they’ll at least come back to see one more picture of yours – and we’ll make that one a musical that can’t miss!" "I was scared to death to do it," said Deanna. "But I wanted to do it more than any picture I have ever made. I’ve done romantic comedies so long that I just didn’t know whether or not I’d be capable of playing a dramatic part. It’s the first script I’ve taken home and studied since THREE SMART GIRLS. I’ve done thirteen pictures the nine years I have been on the Universal lot, and I’ve always played a sweet young thing with no problems. The roles were so easy I just found myself walking through them. But CHRISTMAS HOLIDAY I knew would be a real test of my ability." "When I heard that Gene Kelly had been signed I was even more excited because I felt that Gene was absolutely perfect for the script! I met him for the first time the day he came over to the studio to discuss the script with Felix Jackson and the director, Robert Siodmak." Since her separation from Vaughn Paul, whom she married in 1941, Deanna has lived alone in the Brentwood house she built three years ago. She has one servant, a housekeeper, who cooks for her and looks after her. When she isn’t working she likes to dress up pretty and go dancing with Felix Jackson or Dean Harens. Gin-rummy, the national pastime in Hollywood, doesn’t appeal to her. Nor bridge, nor poker. The minute she starts a picture she sort of holes in until the film is finished. "I read a lot when I come home from the studio, before I go to bed. And when my eyes are tired from the bright studio lights I wear glasses when I read," she added. A fan wrote in that she was shocked to see Deanna wearing glasses in a scene in CHRISTMAS HOLIDAY. Felix Jackson kept his promise. Just in case the fans don’t like Deanna in a CHRISTMAS HOLIDAY type of role he has rushed her into a super musical that has more songs in it than Deanna has ever had in a picture before. It’s a costume picture, in Technicolor, and will be called CAN'T HELP SINGING, from the title song. It will be Deanna’s first venture into Technicolor and she looks so beautiful that it’s dreadfully depressing to the rest of womankind!